Find out everything you need to know on the new Peugeot Partner Standard Diesel from independent vehicle review website Car And Driving. You can watch the video review to the left to see more of the car or read their written review below to get a true insight from an expert in the automotive industry. Versatile, user-friendly and affordable is a good place to start when designing an MPV. When Peugeot looked around for a platform that could deliver in these key areas, the one underpinning its Partner emerged as a front runner. The only problem was that the Partner was a van. Undeterred, the French manufacturer went ahead anyway and the resulting Partner Combi ended up as a founder member of the van-based MPV sector. Six years later, the Partner's larger, higher quality commercial vehicle replacement also spawned an MPV version. 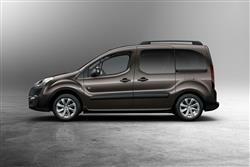 That's the Peugeot Partner Tepee we look at here. Tepee might be a vaguely silly name for a car but it's fair to say that people who are overly concerned about what the neighbours think don't buy van-based MPVs. It's a long way up from here to the height of fashion but if you're after maximum practicality at minimum cost, the Partner Tepee and its ilk are where it's at. The car launched in 2008 amid claims that it offered considerably more size and sophistication than the old Partner Combi. These turned out to be well-founded with the Tepee representing a marked step upmarket from the utilitarian original. This was possible because around the same time, Peugeot launched van and MPV versions of the smaller Bipper. With lower prices and an even sillier name, the Bipper Tepee models took care of the affordable end of things, allowing the Partner Tepee variants to stretch their legs in a more salubrious direction. Of course, it remained a van-based MPV: let's not get ahead of ourselves here. As with the original Partner, this model had an identical twin with Citroen badges known as the Berlingo or the Berlingo Multispace in MPV guise. 1.6-litre petrol and HDi diesel engines were offered, with trim levels running from Urban to S and Outdoor. The Outdoor models feature 4x4 styling cues which give a more rugged look to the Partner but aren't particularly convincing. In 2009, 7-seater versions were introduced, bringing more practicality and underlining just how much room there is inside one of these cars. The unique selling point of vehicles of this ilk has always been their ability to carry five passengers and a lot of luggage in a compact and nimble package. The Partner Tepee may be substantially larger than the vehicle it replaced and some of the manoeuvrability may have ebbed away in the growth process but the space inside was bigger than ever - hence the opportunity for Peugeot to offer a 7-seat option pack. Legroom on the main back seat is fine for adults and positively luxurious for small children. The boot measures in at 574 litres which surpasses the luggage space in pricier compact MPVs like Citroen's C4 Picasso (a car that rides on the same platform as the Partner) and Ford's C-MAX. Peugeot also worked hard on the look and feel of the interior. The quality of the materials and of the construction might not be the classiest you'll experience but they certainly don't speak too loudly of a hastily reconfigured van. Raw space was never going to be a problem for the Partner Tepee but the designers have also made sure that owners can get the most from it. Storage solutions abound under every flap and in every crevice with more ingenious inclusions as you ascend the trim level range. On top of the basic door pockets, shelves and glove boxes, buyers ticking all the boxes could find items to cram into under seat draws, under floor cubbies, a centre storage console and an internal roof-rack that stores long items securely within the vehicle that would normally need to be clamped on to the top. Access to the rear seats is through the van-style sliding side doors which are ideal in tight spaces and you get at the boot though the large tailgate. There was also the option of an opening rear screen so owners didn't need to lift the whole tailgate all the time. The Partner Tepee feels pretty durable: it has its commercial vehicle roots to thank for that. It is, however, the nature of the van-based MPV market that models come in for some pretty rough treatment. It's always best to give the interior a thorough going over to make sure all the handles, levers, buttons and dials work as they should. (Approx - based on a 2008 Partner Tepee 1.6 HDI - ex Vat) Front brake discs are around £25 and pads are around £40. Shock absorbers start at around £30, you'll pay £60 for a battery and a timing belt kit will be around £80. The engine range was weighted three to two in favour of diesel, Peugeot obviously deeming 1.6-litres the optimum for the propelling the Partner Tepee as all five of its engines share that capacity. The oil-burners are the 1.6 HDi common-rail injection units that are found across the Peugeot line-up of this era. They're dependable and economical with a smooth power delivery but exactly how much power is delivered depends on your choice of HDi 75, HDi 90 or HDi 110. The smaller two units are self explanatory but the HDi 110 range-topper can't quite live up to its 110 billing. It has a 107bhp output. The petrol engines are rated at 89bhp and 120bhp and, predictably, are a bit smoother, a bit quieter and a lot thirstier. The Partner engine range lacks variety and how far buyers should bother to climb up it will depend on the kind of usage they intent to put their Tepee through. The entry level petrol and diesels will be quite adequate for the low mileage, school run and shopping trip routine that is the Partner's stock in trade but the more powerful options are worth shelling out for if the vehicle is going to be regularly faced with long journeys, heavy loads or a family holiday entailing both. Whichever engine you choose, the Partner isn't going to be fast, the 14s of the 1.6-litre petrol being its liveliest 0-60mph sprint time. The 34mpg average of the entry-level petrol model is nothing to get over excited about but the diesels all pepper the 50mpg mark with the range-topping 1.6 HDi 110 engine actually delivering the best economy with 50.4mpg. Emissions for that Tepee, which also comes equipped with a diesel particulate filter, are 147g/km The Partner Tepee might be van-based but that's something of a misnomer with this model because the Partner van is car-based. If you think that sounds confusing, you'd be right but the fact is that the van shares its underpinnings with various Peugeot and Citroen passenger cars including the 308 family hatch. What all boils down to is that today's Partner Tepee has a more advanced car-like suspension set-up and, in general, feels far less rough around the edges that the old model. Along with the rigidity in the suspension, a little of the cornering stability has gone but that's a trade most happily will make for the enhanced ride quality and comfort. You have to admire the simple honesty of the Partner Tepee. It's clearly a van with windows but the level of versatility that opens up for family buyers is not to be taken lightly. There's little else for the price that can carry so much so easily and its performance on the road is more than adequate. There are quite a few van-based MPVs out there but few of these conversions go to the lengths that the Partner Tepee does. Higher spec models are packed with storage space and although the seats don't perform the tricks you'd expect in a proper compact MPV, the interior is reasonably adaptable. The last word in style or desirability it isn't, but the Tepee fills an intensely useful niche in the market.